ICC has developed an open-source reference implementation to support the adoption of iccMAX. 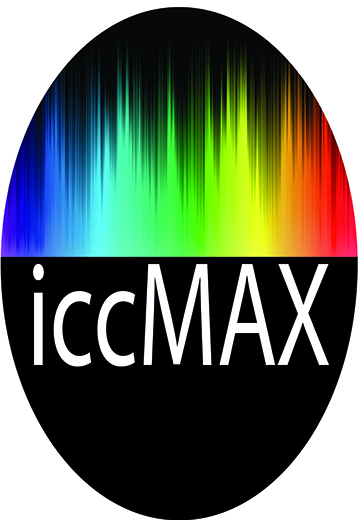 The RefIccMAX project provides an open source set of libraries and tools that allow for the interaction, manipulation, and application of iccMAX based color management profiles based on the iccMAX profile specification, in addition to legacy ICC profiles defined by earlier ICC profile specifications. Note: The SampleICC and iccXML projects were used as a basis for the further implementation of RefIccMAX. RefIccMAX is hosted on a GitHub repository to enable developers to contribute to the project, and to ensure that the latest version is available from a single source. The project includes source code, header files, and project files (MS Visual Studio and Mac XCode) for the libraries and tools provided by RefIccMAX as well as a comprehensive set of test profile definition files with batch files to create and test the application of transforms within iccMAX profiles. Win32 executables and Testing Archives (containing test profiles etc) are available. The current version of these executables and test archives is 2.1.2 (1 March 2016).